by Andy Higgs in England, Europe, Features, Places. We’ve already visited the Christmas markets of Berlin, Paris, Stockholm, New York, Copenhagen, Rome and Amsterdam. Today we’re back in Britain to see what the capital has to offer. The number of markets keeps on growing and there is an appealing trend away from the more garish flashing lights and plasticky decor of years past towards a more traditional approach. Hyde Park undergoes a Christmas makeover again this festive season with the largest outdoor ice rink in Britain encircling the Victorian bandstand lit by over 100,000 bulbs. The Magical Ice Kingdom is also the largest such attraction in the UK, sculpted from 200 tonnes of ice and snow. You can explore the frozen paths and wander in an ice forest – watch out for ice trolls and if you are feeling brave join the knights in their battle to slay the evil ogre. Or chill out (literally) at the Ice Bar, a popular addition from 2013. There are plenty of other rides and attractions including a Giant Observation Wheel and two circuses arranged by the family friendly Zippos circus – ‘Cirque Berserk’ and ‘Christmas Circus’. You will need to buy tickets for most of these activities but entry to the site itself is free and includes Santa Land and the Christmas Market. The atmosphere is great and the market stalls offer a wide range of gifts and decorations. There are open fires to provide warmth if the mulled wine and hot cider don’t do the trick. You’ll have to get moving as it takes place early in the month but for a pre-Christmas treat for the children it’s hard to beat this event at East London’s oldest family home, Sutton House. Santa has found a window in his rather hectic schedule to show up at this two-day event hosting pop-up craft stalls and craft workshops along with the bearded fellow’s grotto. With carol singers, mulled wine and mince pies aplenty this will be just the thing to put the whole family in the Christmas spirit. 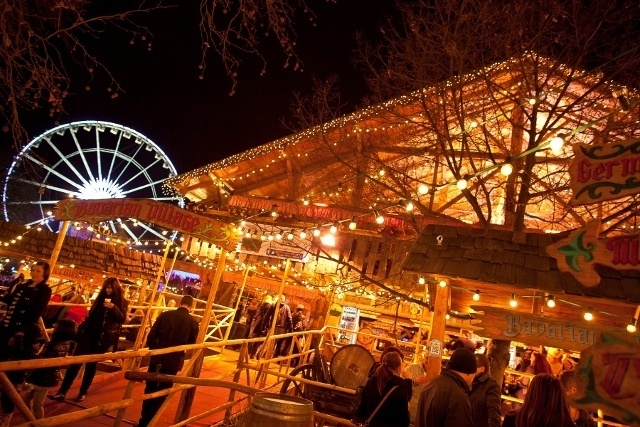 Once again the traditional German-style wooden huts are back at Queen’s Walk for the Southbank Centre Christmas Market. 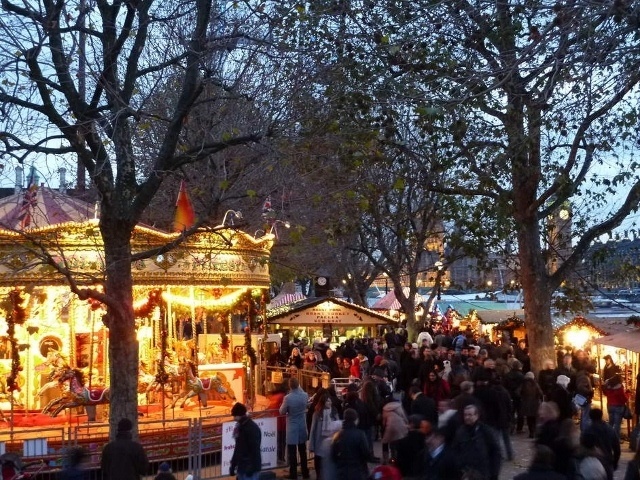 On the waterfront between the Southbank Centre and the London Eye the stalls do a roaring trade in toys and gifts as well as food and drink – chomp on a Bratwurst washed down with Glühwein and enjoy some gingerbread to finish. Children can make their own Christmas cards at one of the stands and there’s also a pocket-money stall with affordable gifts to suit these austere times. To add to the festive atmosphere choirs will sing carols and Christmas songs twice a day. If the crowds and hassle of Oxford Street with its bawdy lights are getting you down, come to Covent Garden for a different take on Christmas. The piazza is the main focus but some of the neighbouring streets are also included in the festive fun. 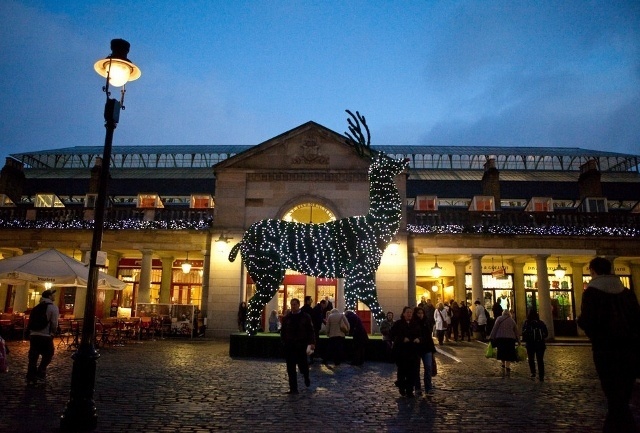 As well as the stalls selling all manner of handicrafts Covent Garden Christmas offers a wide range of activities which this year includes a giant (22 feet tall) silver reindeer. You’ll also have the chance to meet a real live Rudolf or two as reindeer petting is again on the agenda each Saturday from 1200-1600. If that wasn’t enough, this year’s huge LEGO installation features Santa on his sled pulled by nine reindeer, with Rudolf of course at the front (until 29 December). There will be also be carol singing from some of London’s most loved choirs. Christmas isn’t just about decorations and gifts, right? It’s also all about the food. This year, why not avoid the crush at the supermarket and source your nosh directly from the producers? At the Real Food Market at Southbank Centre Square you can wander the stalls with the obligatory mulled wine or spicy cider in one hand and a freshly baked mince pie in the other. How about hand-made, artisan chocolates, a wide selection of farmhouse, raw-milk cheeses, pickles, chutneys, sparkling wines, spirits and the very best meat products – turkeys, geese, lamb or beef. Make sure you order early then come down and pick up your free-range turkey or goose from the Thoroughly Wild Meat Co at the ‘farm gate’ price. You can also pick up a traditional hand-made Christmas wreath and even a Christmas tree too. The trees are grown in Kent and the supply is managed by the Forestry Commission to ensure that more trees are planted each year than are harvested. Don’t forget that real trees use about 10 times fewer materials and five times less energy than artificial trees – and are just, well better, surely? I have been to Hyde Park Winter Wonderland before and highly recommend it.